Just Ask D: Get the most out of your coaching time! Get the most out of your coaching time! 1. Create a level of trust with your coach. Early on, get personal and share who you are, your likes, dislikes, hobbies, past work experience and current objectives. People work together better when they feel comfortable enough to articulate questions and concerns. What your coach learns about you will help determine which strategies and action steps are the most likely to help you become successful. 2. Stay open-minded. No one has all the answers but there are many options to explore. Your coach is there to work with you so focus on listening. 3. Develop the habit of recapping what you’ve learned via action steps. What are you going to do next? Document it. Share your intentions with your coach. You won’t forget what’s expected of you next and review your successes upon your next call. 4. Become consistent. Keeping scheduled calls to develop accountability is important to work on your goals. Email in between whether to review something, discuss an update or ask a question so your coach can stay on top of your progress. 5. Make the focus of your course a top priority. Actively work toward accomplishing assigned tasks each week. Look for ways to get the work done, not for excuses as to why you couldn’t. 6. Set realistic goals about the time you have available to pursue your goals and your ability to succeed. Set goals that inspire and drive growth without becoming overwhelming. 7. Listen with the intent to take action. Focus on action steps at all times. There’s a big difference between acknowledging the information shared and actively doing what needs to be done to move forward. Engage with the knowledge your coach imparts. Coaching is a two-way street and all the instruction in the world won't help if action is taken after the session. 8. Don’t be afraid to get real. This is your coach. They are here to help. Having a coach, especially one you’ve hired, is a unique experience. Maybe you’ve never opened up about your ideas before or verbalized your ambitions out loud. Now is the time. This is what it's all about, being able to clearly and concisely express a message is an invaluable skill you will use over and over again. 9. Do the work. Better yet, return asking for more. If you want to achieve your full potential and monetize your ideas, you’re going to need to be enthusiastic. 10. Be patient. Nothing happens overnight. At the same time, you need to maintain a sense of urgency to the tasks ahead. Accept the process for what it is, that it might take longer than you want. There's no point in letting forces out of your control frustrate you. But do everything in your power that you can. It’s a balancing act, to be sure. 11. Don't let projects sit too long. Follow up, follow up -- and then follow up some more. Use any down time to learn even more and in turn, better prepare yourself for the future. If you follow these steps, you'll get the most out of working with a coach. 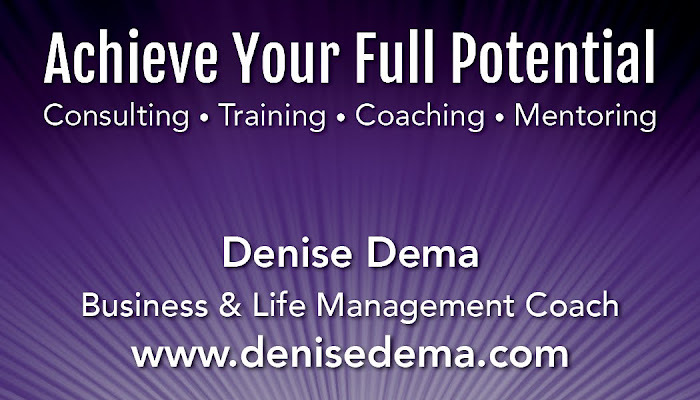 Book a complimentary session at Business and Life Management Coaching to start achieving your full potential today!